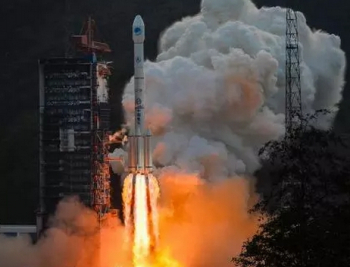 The fifth Chinese launch in September took place at 23:13 UTC on Tuesday (Wednesday morning local time) with a Long March-3B/G2 rocket orbiting another Beidou-3 navigation satellite. The launch of BDS I2-S (or Beidou-20) took place from the Xichang Satellite Launch Center via the modified pad 3. Tuesday’s launch is another steady step in the completion of the Phase III of the Beidou program several years ahead of schedule – by as soon as 2017, rather than 2020. 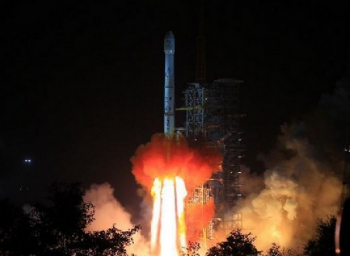 However, the launch initially received a blackout in the Chinese media, with lift-off only confirmed by local observers. 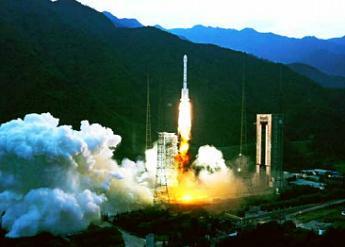 It took over an hour – once the spacecraft was successfully deployed – for the Chinese media to acknowledge the launch. The Beidou Phase III system includes the migration of its civil Beidou 1 or B1 signal from 1561.098 MHz to a frequency centered at 1575.42 MHz – the same as the GPS L1 and Galileo E1 civil signals – and its transformation from a quadrature phase shift keying (QPSK) modulation to a multiplexed binary offset carrier (MBOC) modulation similar to the future GPS L1C and Galileo’s E1. The current (Phase II) B1 open service signal uses QPSK modulation with 4.092 megahertz bandwidth centered at 1561.098 MHz. The current Beidou constellation of geostationary (GEO) – five inclined geosynchronous orbit (IGSO), and four middle Earth orbiting (MEO) – spacecraft are transmitting open and authorized signals at B2 (1207.14 MHz) and an authorized service at B3 (1268.52 MHz). Real-time, stand-alone Beidou horizontal positioning accuracy was classed as better than 6 meters (95 percent) and with a vertical accuracy better than 10 meters (95 percent). The Compass Navigation Satellite System (CNSS) is China’s satellite navigation system, approved by the Chinese government in 2004, capable of providing continuous, real-time passive 3D geo-spatial positioning and speed measurement. 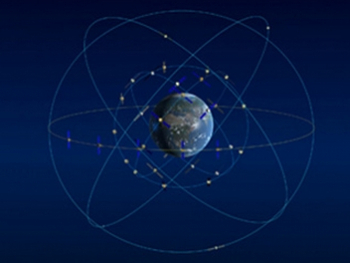 The Chinese navigation system is being developed and deployed in three phases: Phase 1 (starting in 2003), consisted of an experimental regional navigation system, BeiDou-1, which provided active navigation service; Phase 2 (started in 2012), consisted of a reduced satellite constellation and provides open service over China. This phase aimed at deploying a system with passive positioning and timing capability over a regional area; Phase 3 (starting in 2020), by 2020, the system would reach full operational capability with a constellation of 27 MEOs plus 5 GEOs and the existing 3 IGSOs satellites of the regional system. CNSS would provide global navigation services, similarly to the GPS, GLONASS or Galileo systems. CNSS is expected to support two different kind of general services: RDSS and RNSS. In the Radio Determination Satellite Service (RDSS), the user position is computed by a ground station using the round trip time of signals exchanged via GEO satellite. The RDSS Long term feature further includes: short message communication (guaranteeing backward compatibility with Beidou-1), large volume message communication, information connection, and extended coverage. The Radio Navigation Satellite Service (RNSS) is very similar to that provided by GPS and Galileo and is designed to achieve similar performances. The long-term goal is to develop a global navigation satellite network similar to the GPS and GLONASS by 2020 eventually consisting a constellation of 35 vehicles, including 27 MEO (21,500 km orbits) satellites, three IGSO satellites (inclined at 55 degrees) and five GSO satellites. The system will be dual use, based on a civilian service that will provide an accuracy of 10 meters in the user position, 0.2 m/s on the user velocity and 50 nanoseconds in time accuracy; and the military and authorized user’s service, providing higher accuracies. The first phase of the project will involve coverage of the Chinese territory. However, the future Compass constellation will cover the entire globe. The new satellite – now named as BDS I2-S (Beidou-20) – uses a new bus that feature a phased array antenna for navigation signals and a laser retroreflector. Launch mass is about 800/850 kg and the satellites have an operational lifespan of 10 years. 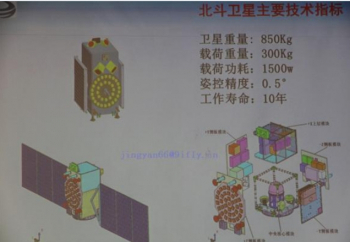 Previous BDS I1-S satellite was built by the Shanghai Small Satellite Center of the Chinese Academy of Sciences (CAS). Developed from the Chang Zheng-3A, the Chang Zheng-3B is the most powerful launch vehicle on the Chinese space launch fleet. The CZ-3B/G2 (Enhanced Version) launch vehicle was developed from the CZ-3B, increasing the GTO capacity up to 5,500kg. The CZ-3B can also use the new Yuanzheng-1 (“Expedition-1″) upper stage that uses a small thrust 6.5 kN engine burning UDMH/N2O4 with specific impulse at 3,092 m/s. The upper stage is able to conduct two burns, having a 6.5 hour lifetime and is capable of achieving a variety of orbits. This upper stage was not used on this launch. Tuesday’s launch took place from the modernized Pad LC3.